Sometimes you just get lucky. A friend had shown me this location in the Texas Hill Country, but we'd waited to visit until the flow of water was just right. After heavy rains from weeks prior, the river had risen, then dropped. On this night, all elements of the image came together - water, color, wind, and sky. 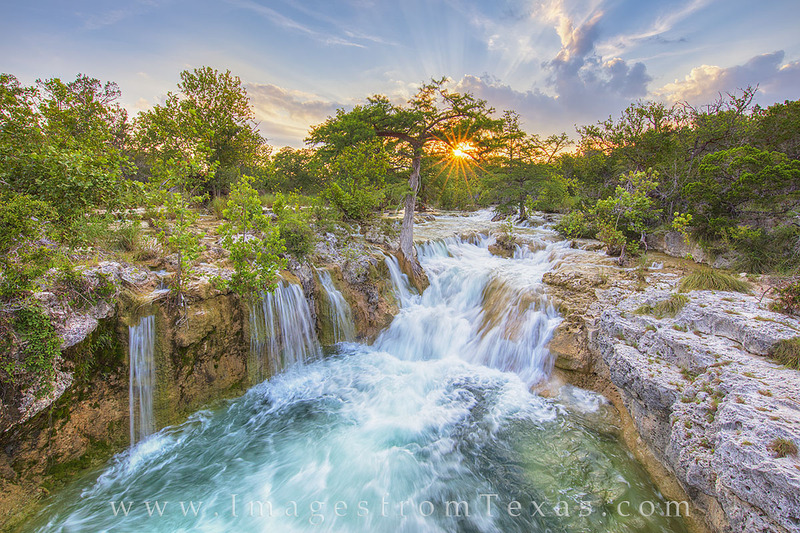 With turquoise falls below me and an amazing sunset peeking through the trees and spreading light rays into the fading thunderheads, I knew this landscape of the Texas landscape of cascading water would be special. This image is available in sizes larger than 36x24. Please contact me for more information.